The 5th Canton Nucleic Acids Forum (CNAF) was held successfully in Guangzhou Science City on November 9th to 10th. The 5th CNAF was organized by the Chinese Society of Biochemistry and Molecular Biology, Guangzhou Institutes of Biomedicine and Health, Chinese Academy of Sciences, the Scientific Technology and Talent Office of Guangzhou Development District, Guangzhou Overseas Returned Scholars Association, Guangzhou RiboBio Co., Ltd., and Guangzhou RiconGene Co., Ltd.
19 distinguished scientists from the nucleic acids field, including the 2015 Nobel Laureate in Chemistry, Dr. Tomas LINDAHL, the 2006 Nobel Laureate in Physiology or Medicine, Dr. Craig C. MELLO, and the 1993 Nobel Laureate in Physiology or Medicine, Dr. Richard J. ROBERTS was invited to attend the conference and gave their inspiring presentation at the 5th CNAF event. The conference speeches have been centered on the following four themes 1) latest advances in non-coding RNA research , 2) nucleic acids based clinical trial, 3) nucleic acids based diagnostics and biomarkers and 4) nucleic acids based therapeutics. 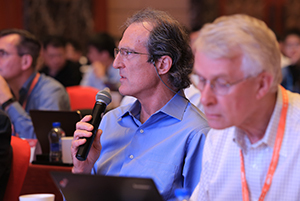 Nearly 400 attendees from Sun Yat-sen University, Fudan University, Zhejiang Cancer Hospital and other well-known universities, medical colleges and biotechnology research institutes participated in the conference. Numbers of media organizations have reported this successful event, including Nan Fang Daily, Seqchina, Ebiotrade. 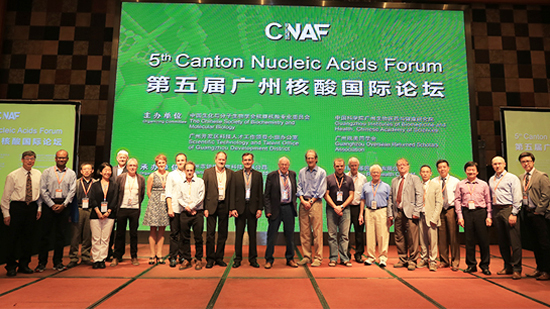 The “Canton Nucleic Acids Forum” (CNAF) which began in 2013, is widely recognized as Asia’s premier forum for advancing nucleic acids research and drug development. The CNAF has attracted high-profile speakers, including Nobel Prize winners, to highlight recent advances in nucleic-acid based medicine, research and development and industry trends. It is a series of recurring and nonprofit conferences with the initial goal of exposing Chinese scientists to the latest advances in science and technologies and with the longer range mission of strengthening the dialogue and collaboration between Eastern and Western scientists, promoting the integration of the quickly progressing and expanding Chinese and the established world scientific communities engaged in nucleic acids R&D. 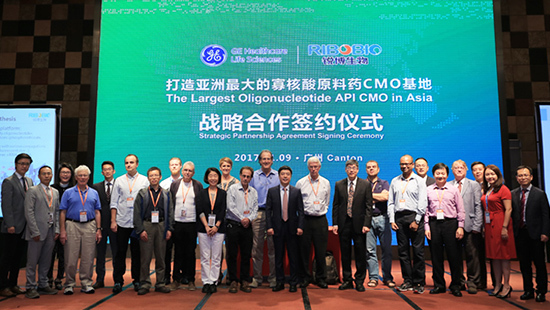 At the 5th Canton Nucleic Acids Forum (CNAF), Guangzhou RiboBio Co., Ltd. (“RiboBio”) and GE Healthcare Life Sciences (“GE”) held a strategic partnership signing ceremony. The strategic partnership agreement is aimed at establishing a deep alliance to jointly build Asia’s largest oligonucleotide drug development and manufacturing facility in China. The goal of this partnership is to provide a total solution for oligonucleotide drug companies worldwide. Guangzhou RiboBio Co., Ltd. was founded in 2004 and is currently led by a Nobel Laureate as well as distinguished experts in the field of nucleic acid science. RiboBio is focused in the field of nucleic acids-based technologies offering products and services. 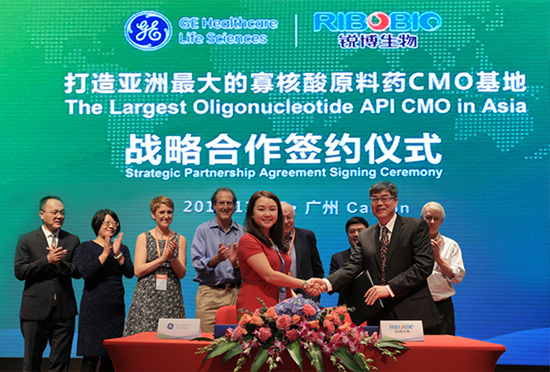 In 2013, RiboBio built China’s first cGMP oligonucleotide manufacturing facility and was issued a Drug Manufacturing Permit for oligonucleotide API manufacturing from CFDA. RiboBio is the leading world-class biotechnology company in China, striving to provide the highest-quality oligonucleotide products and services to clients worldwide.